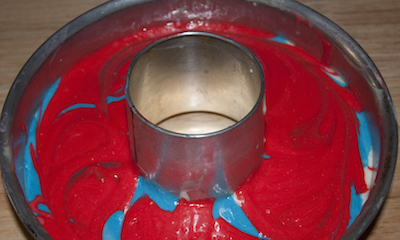 Did you know you can color your cake batter the same way you color your icing? This is a simple way to make the inside of your cake a fun surprise. 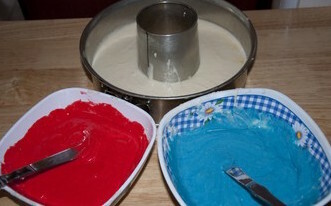 Try adding a touch of blue or pink to your batter to make a pastel color for Easter or yellow and orange for Halloween. Whether it is a holiday or just a party dessert, this easy method is sure to bring a smile on your guests face. First prepare a white cake batter. If you are making a larger layered design such as the size below you will need to make two batches of 13x9. Coloring each layer a different color. A batch of batter will also make 2 round cakes so you can divide your batter in two separate bowls and add different colors to each half. Then pour into your prepared round pan and bake. Color your white cake batter the same way you do the icing. Rub a small amount of color on a toothpick or a small drop if using a liquid color. Remember it doesn't take a lot to get a nice color, so just start with a touch at first. Blend the color into your batter until well combined. Pour in your greased prepared pan and bake as usual. Lay the bottom layer on your plate or serving platter and add a layer of frosting. Then add the top layer. Decorate! You can also make a swirled or marble effect doing this same technique. Separate your white batter into as many portions you'd like. Add a small amount of different coloring in each bowl. Stir batter until well combined. Drop colored batter into your prepared pan in the design you would like. Swirl with a knife to make a marbled look or leave as is. 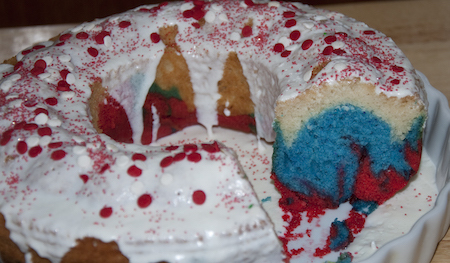 Below we created a 4th of July color design by first adding white batter to the pan and dropping red and blue batter into the white. 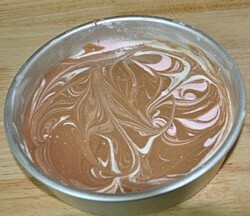 Then with a knife I gently swirled the batter to make a marbled look. This same method can also make a Neopolation look. 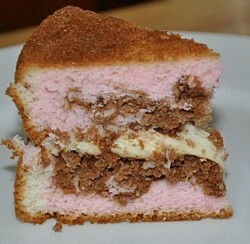 With a white, chocolate and a pink layer flavored with strawberry. 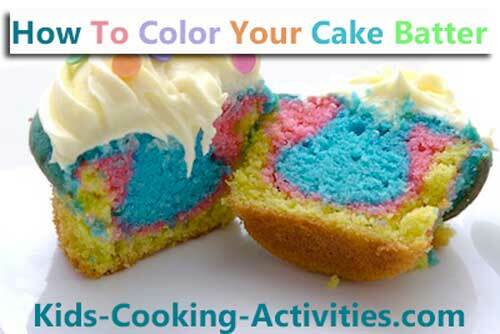 You can use this idea to create rainbow cupcakes. 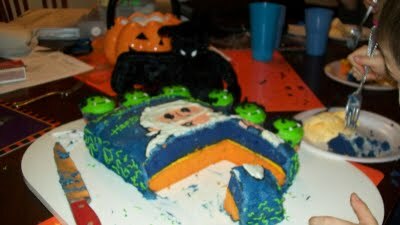 I like to use food gels or liquid food coloring for this decorating method.